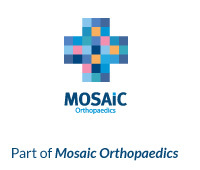 Hip surgeons can sometimes get a little blasé about what we do for a living. After all, it’s something we do nearly every day of the week. So now and again it’s worth restating: hip replacement really is an amazing procedure. Last year there were over 107,000 hip operations in the UK alone. And there’s a good reason why they have become so commonplace: for the vast majority of patients, the outcomes are excellent and hip pain becomes a thing of the past. But of course in surgery as in life, nothing lasts forever. Bodies age. Materials wear down. And sometimes implants can stop working as they once did. That’s where revision hip surgery comes in. In truth it’s not always well understood, so I thought it would be a good idea to unpack it here. What exactly is revision hip surgery? Revision hip surgery is what happens when a hip replacement fails. 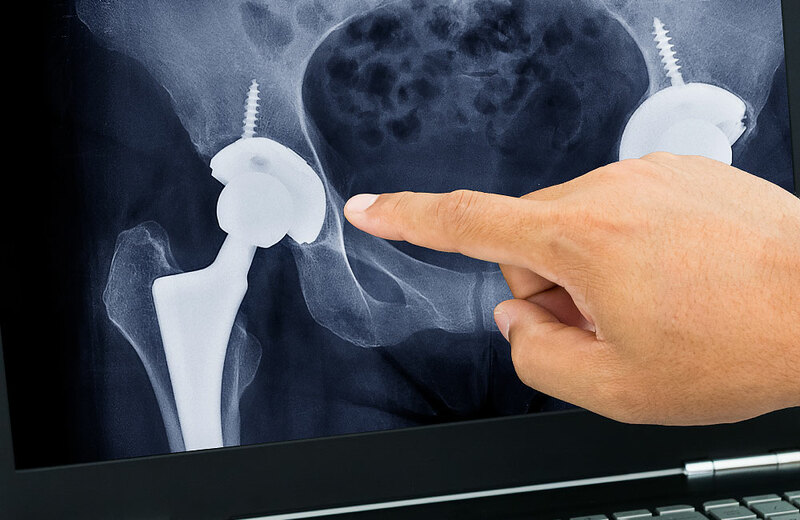 It’s a second operation where one or more parts of the old implant are replaced with new ones, in order to restore pain-free function to the hips. How would I know if I needed it? The short answer is: pain. Most people first become aware of a problem when their hip starts to feel uncomfortable again. This usually tends to happen after rest – it feels a bit painful to climb out of a low chair, for example – but the discomfort then wears off. We call this ‘start-up pain’, and it’s typical of patients whose implants are becoming problematic. What actually causes implant failure? Hip implant technology has seen incremental evolutionary changes since THR came into use nearly 60 years ago. Even so, the pressures we exert on our bodies mean they will eventually wear out – as all artificial prostheses do. One of the main reasons for this is that, over time, the surfaces of the bearings produce debris. The cells responsible for removing bone react to this debris by becoming a little more active, causing the bones around the implant to thin. This in turn causes a loosening and weakening of the interfaces between implant and bone. Under x-ray, we can see this process in action. The head of the implant might be sitting slightly eccentrically in its socket. Or we might be able to see lines appearing around that implant. Another potential cause of implant failure is an accident: a slip, a fall, perhaps even a car crash. This can cause the bones around the implant to break (we call this kind of break a periprosthetic fracture). Theoretically the prosthesis itself could fracture, though with modern implants this is very rare. More often, the implant dislocates: put simply, the forces acting on the joint exceed the capacity of the soft tissue to keep the implant in place, so it pops out. Dislocations can occur through wear, too, or through a number of other factors including the patient’s age, their muscle strength, or even whether the implant was put in properly during initial surgery. Either way, it’s likely to be very painful. 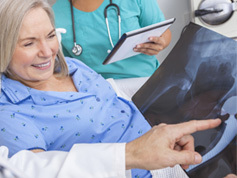 Doctors are often able to restore the hip to its place in hospital. But sometimes this won’t be sufficient and revision surgery becomes necessary. Infection is the other big factor in hip failure. It can happen in a few ways. Though great care is taken during surgery, bacteria sometimes elude the antisepsis in theatre and get into the implant area. Or sometimes an infection occurs elsewhere in the body – the chest, perhaps, or the urinary tract – and moves to the hip, where it becomes difficult for the body to eradicate. Signs of an infection can vary, from a developing discomfort in the hips to a sudden, acute infection where the patient feels very unwell. The bottom line? The good news is that hip failures are rare. Most patients who have a replacement aren’t troubled by it again in their lifetime – and that’s partly down to the advances that have been made in modern prostheses. Surgical techniques have evolved very quickly over the past 10 or 15 years. The implants and materials are better, too, and help to minimise the complications of revision. The key thing is to make sure the surgery is done by a specialist. Hip revision is a complex procedure which needs expert care and supervision. If you’d like to know more about the ins and outs of revision, we’d be very happy to help you explore the options. You can book an appointment on the website. And you can get more detail about revision surgery on my YouTube channel.